Yesterday morning at the Northern Colorado Writers coffee the topic of reprinting and re-slanting articles came up. One writer said he had done a lot of research on a topic and wanted to know how he could make use of all his work and sell different articles on the same topic.This led to a discussion on reprints and re-slanting and today, to the topic for my post. With reprints, you are selling an article that has already been printed. No changes have to be made to the article and you can send it out as is. Not all publications take reprints so check the guidelines first and then be sure to let them know it is a reprint. Typically you get paid half of what you received for the original article. It is a great way to generate more income and clips from an article that is already finished. Selling reprints is fabulous, but I believe the key to staying busy as a freelance writer, is to take the information and research you have and slant it as many different ways and times as you can to as many different publications as you can. A graphic organizer is really helpful to do this. Here is an example of one. 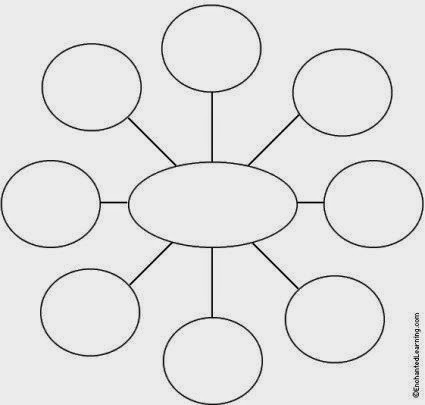 If you are not familiar with how one works, you put your main topic in the big circle (the topic you have done all the research on). Then you start branching off with sub topics in the smaller circles, then branch off of those and so on. You can have fun with this by using a big piece of paper and different colored markers or colored pencils. For example, lets say I want to do an article on Fort Collins, Colorado. I've done a lot of research on the topic, plus I live here. "Fort Collins" would go in the big circle and then I could branch off with topics like outdoor activities, micro breweries, history of the city, pet friendliness, festivals and so on. Then I can take these topics and break them down even more. Once I have all these ideas, I can begin to slant them to fit different magazines. Fort Collins is known for its outdoor recreation. I could pitch an article to Women's Adventure Magazine about the great rock climbing at Horsetooth Reservoir and then take some of the same information and pitch an article to FamilyFun about the reservoir being a great family destination with cabins to rent, swimming, boating and hiking. I am taking the same basic information, but I am slanting the focus to fit in two completely different markets. It keeps my brain focused on the one big topic, so it doesn't feel scattered, allowing me to get more queries and articles done. What do you think is the key to generating more work as a freelancer? Reprints? Re-slanting? Something else? Having worked non-fiction as you mention, I don't think the techniques are separate. They are both tools for generating income. Reslanting also helps make you an expert in that subject area, which is a definite plus for marketing yourself as a freelancer. I am not a freelance writer, but what you say is so true in many professions. When fundraising for a charity, for instance, that is the key to success. To find out what the funders need, and slant your pitch to their needs.